Last week service design consultancy livework took the next step in their engagement with science-based enterprise G-nostics which forms part of this research project. G-nostics develops services which offer personalised treatment for medical conditions. Using a simple finger-prick test, G-nostics can identify each person's unique molecular profile and then use this information to predict individual response to drug therapy. This pharmacogenetic technology can identify the best treatment with lowest risk of side effects in a wide range of medical conditions (from their website). An example of this is their service NicoTest, a personalised smoking cessation programme to minimise adverse reactions and ensure the right medication and right dosage levels are followed. As part of this research project, livework are reviewing the service design of NicoTest. As part of this work, designers Ben Reason and Paul Sims from livework decided to go with Pablo Toledo from G-nostics to a pharmacy in Basildon, Essex, which is currently running a trial of NicoTest in association with the local Primary Care Trust. 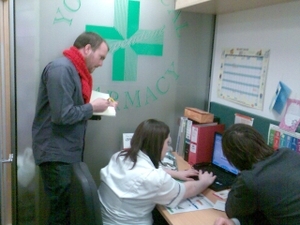 There, Ben asked pharmacy assistant Cherry Osbourne to do a "walk through" with him of the process that someone signing up for the NicoTest service goes through, which includes providing a sample of blood (by pricking a finger) and a sample of spit, and a process in which Cherry gradually filled in a series of online forms in the pharmacist's NicoTest website. The NicoTest service is delivered over a period of weeks in person (through drop in visits to a pharmacy), via email and text messages, and via a website. To document this research into the design of the NicoTest service, we filmed the encounter between livework, G-nostics, and the pharmacy, took notes, and then interviewed Ben and Paul, and Pablo. The next stage is a design review at livework's offices in London.